After nearly 21 consecutive weeks of protests, the administration of Guatemalan President Otto Pérez Molina has finally unraveled. At 1am in the morning on September 3, the President’s spokesman, Jorge Ortega made the announcement that the embattled President had officially resigned. Later in the day the Guatemalan congress recognized the resignation. Otto Pérez Molina has become only the second president to be forced to resign because of a popular uprising since the 1944 revolution forced dictator Jorge Ubico to resign. Pérez Molina’s resignation comes two days after the Guatemalan Congress voted unanimously to strip the President of his immunity. The congress only needed 105 votes to strip the presidents’ immunity, but received 132 votes in favor, with 24 deputies abstaining. The United Nations backed anti-impunity body CICIG and the Guatemalan Public Ministry followed that announcement by filling an arrest warrant for the president with Judge Miguel Ángel Gálvez. The President is accused of taking part in the criminal network called ‘the Line,” which defrauded the Guatemalan people of over $120 million dollars. Following his resignation, Pérez Molina was arrested and taken before a judge to make his first declaration. Following the hearing, the judge ordered that the former President must be transferred to prison. His resignation comes three days before Guatemala is set to vote in the 2015 Presidential elections. His Vice-President, Alejandro Maldonado Aguirre, who took office following the resignation of former Vice-President Roxana Baldetti, replaces the former President. The former Vice-President was forced to resign over her participation in the corruption scandal. 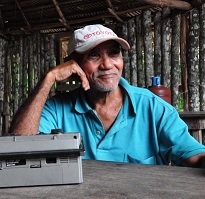 Maldonado is a former member of the anti-communist death squad, National Liberation Movement, and former Minister of Education under the military government of Carlos Arana Osorio, from 1970 to 1974. His connections to the hard right in Guatemala have raised concerns for members of the movement that brought down Pérez Molina. Maldonado will serve as interim President until January when the new President is sworn in. Support for the president has plummeted since the revelations of corruption in his administration. Nearly every member of the cabinet has resigned or been arrested, including the Vice-President who is currently incarcerated. Several members of the cabinet fled the country following their resignations, including Mauricio López Bonilla, the form Interior Minister and former military general, and Manuel López Ambrosio, the ex-minister of Defense, who both fled to the Dominican Republic a week prior to Pérez Molina’s resignation. Finally, weeks prior to his resignation, Pérez Molina lost the support of the Guatemalan business community, which was one of his biggest supporters. Representatives from the Guatemalan business association CACIF publicly called for the President’s resignation in a high profile press conference days following the filing of charges against the president on August 19. Communities across Guatemala took to the streets in celebration upon news of the resignation of the President. In Quetzaltenango, Guatemala’s second largest city, hundreds gathered in the city’s central park for music and fireworks. Protesters in Guatemala City took their celebration to the footsteps of the Guatemalan Electoral council, demanding the suspension or delay of elections. 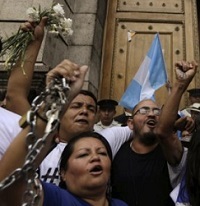 Protesters have also called for the suspension of the party known as LIDER over numerous violations. 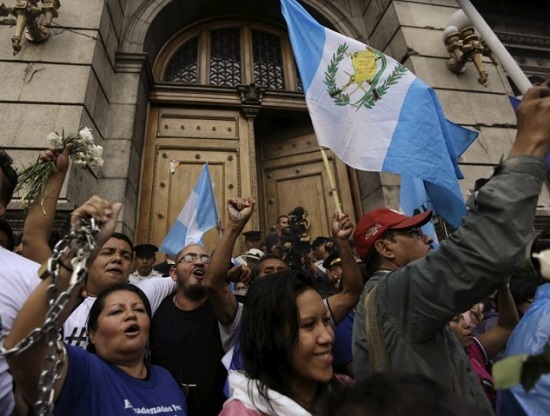 For the moment, Guatemalans are celebrating their victory, but the roots of corruption remain. In many ways, the country belongs to the people between now and September 6th. But after that is when the real struggle begins. 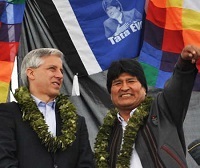 What’s Behind the Bolivian Government’s Attack on NGOs?